This majestic building has an attractive history. Many people will wonder how it is possible that a small village like Ransdorp could build a enormous tower in comparison with the small church. For an better understanding we have to go back to the past. Ransdorp was already of some importance in 1324. This prosperous village developed in the 15th century, by trade, industry and mainly navigation. The community having sufficient funds it was the moment to construct a prestigious tower. A church existed already, the oldest description dates from 1373. During the time of the construction the church was so big that it took the whole square. There is some confusion about the development of the church buildings. When a community decides to build a majestic tower normally it was done beside an already existing big church. So this big church should have been still complete at the beginning of the construction that started sometime between 1502 and 1542 and maybe later it tumbled down. The church being of more than regional importance can be proofed by the following. In 1422 the church got damaged by a lightning. After this happened the 51th bishop of Utrecht, Frederik van Blankenstein, granted a 40-year indulgence to everybody who wanted to visit the church in procession. Of course the indulgence should be paid in advance. The collected money was meant for restoration. Because in 1500 the roof and the rafters of the church were rotten and needed to be restored, the bishop of Haarlem, Nicolaas de Nova Terra, granted an indulgence of the same kind. In the beginning of the 17th century the church should have been totally fallen apart. An engraving by A.Rademaker in 1634 shows that a small church was build in the ruins of a larger church, that was not connected to the tower. Though the tower is large, he is not complete. The upper part of the three sections is slightly fragmentary present and the steeple is not there at all. There are some reasons to explain why the tower is not finished. 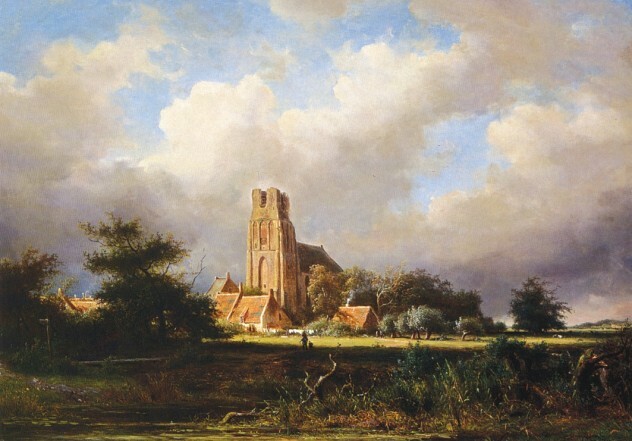 At the end of the 15th and in the beginning of the 16th century it was very common in the Netherlands that towers of churches weren’t finished. Examples are for instance amongst others the towers of St. Lieven Monster in Zierikzee, the towers of Veere, Woudrichem, Wijk bij Duurstede and Leeuwarden. The Reformation could have played role in this. At the end of the 16th century, around 1570, there was a huge decline of economy in the villages of Waterland. A lack of money is probably the most important reason, why the tower was never ended and for sure it will have played a role in de negligence of the church. The tower is approximately 32 meters high and very solid build. Downstairs the walls are approximately 2,25 meters thick, upstairs approximately 2 meters. He is not subsided and the walls are practical not cracked. Nevertheless the church buildings did collapse in such a way that both church buildings had to be demolished in 1718. On the 26th May of 1720 there was a new small church inaugurated. This church was build adjacent the tower. 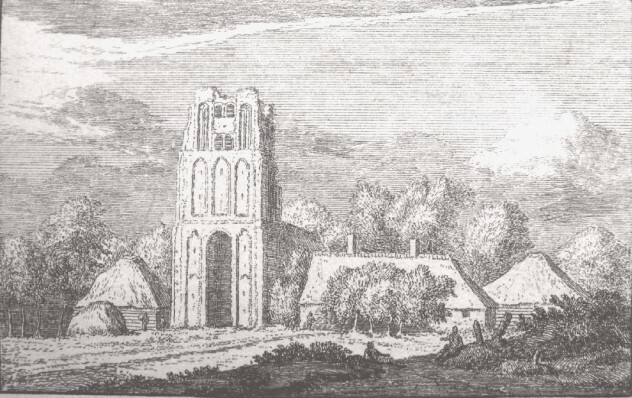 In 1788 the connection between the tower and the church was closed and the people did make a new entrance at the east side of the church. The decline of the tower was so terrible at last that they had to make plans for radical restoration in 1936. The restoration should have been done, in such a way that the building would have the original details again. The big restoration took place between the 18th of May 1936 and the 10th of September 1938. Later on in 1977-’78 and in 1991 they performed a few more restorations. The bricks used for restoration were partly coming from demolition, but mainly they were new bricks. 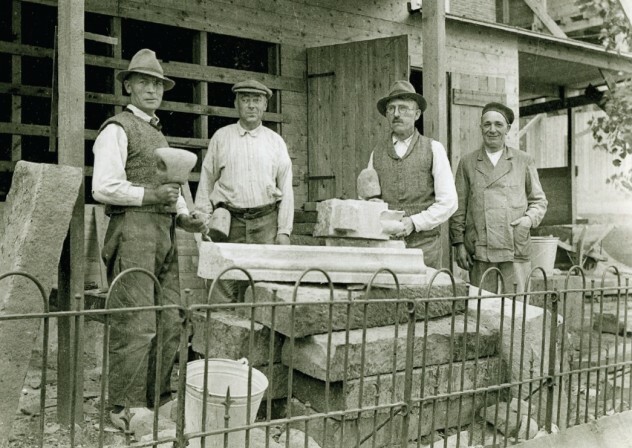 The natural stone, Gildehauser, was prepared on the construction area itself. The reparation was done by twelve scaled laborers, such as stonemasons, carpenters and blacksmiths.